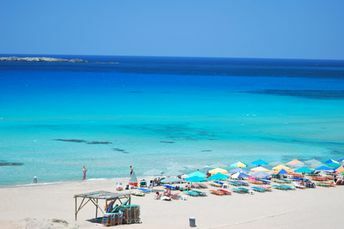 This island ranks #2 of the "Best islands in Greece"
There are lots of hotels on the island, including budget options. Fly to Heraklion International Airport (HER) or to Chania International Airport (CHQ). Next hire a taxi or move by bus. There is also ferry service from mainland to Crete island. Main routes are from Athens (port Piraeus) to Heraklion and to Chania. Summer half of the year. Sea water warms up to a comfortable temperature in July-September. Agioi Apostoli is a great place for beaches in Crete island. It has four different beaches. So it is always possible to find calm water, no matter what is the wind direction. Preveli is another good beach. It's not so comfortable, but it has a lot of palms (like famous Vai beach).